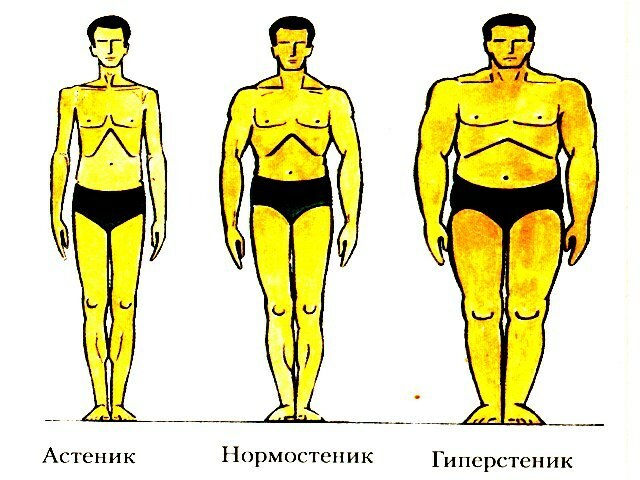 Body type of the person is classified into certain groups depending on various characteristics. Very often you can hear such an expression as "heavy bone". What does this characterization not always clear. In this case, as a rule, I do not mean the weight and width of the bones. In medicine this body type is called "hypersthenic". To determine whether in the category of people with heavy bone, very simple. Enough to do some simple tests. Before you determine your body type, remember some important information. There is a perception that people with severe bone, usually full-bodied. However, it is not so. The width of the bone to a greater extent plays a visual role than it is a sign of the tendency to be overweight. People with big-boned structure of the body have broader hips, chest, shoulders and relatively short legs. That is why, even if a person with this body type has no extra fat on the outside he still looks thin. - 20 cm for males. If you are centimeters, to measure the bone is possible even in an easier way. To do this, simply clench your right hand fingers of the left hand. Girth to do with your thumb and forefinger. If you got it and fingers closed, to belong to the category of people with severe bone not worth it. If between the fingers leaves a gap and can't connect, then your body type that is big-boned. To determine the type of bones can by comparison. Enough to put next to two people with different body type and try to understand the reasons for the visual difference. People with mild and narrow bone have a more delicate proportions than the representatives of the big-boned type. Bones are the only solid material in the human body and its strength close to steel but their weight three times lighter. If people had bones of steel, they would weigh about 180-240 kg. an Interesting phenomenon is the fact that the bones of each person are different weight, which is associated with several factors. In the body of a newborn baby present 350 soft and flexible bones that grow together and in the end, the skeleton adult human consists 206 bones solid. In living bone contains 50% of water, and 15.7% fat, 21.8% of inorganic substances and 12.5% organic matter. In fact, bones are composed of minerals – namely, calcium, magnesium, phosphorus, copper, zinc, barium, aluminum, fluorine, silicon, and so on. The density of all bones is the same, however some people have a fine-boned skeleton with thin fingers, small feet and hands, and narrow shoulders and narrow chest. These people bone, respectively, weigh less than the big-boned people. The weight of bone does not affect the weight of the human body – just the width of the bone depends on the size of the attached muscle, which weighs more than fat. To determine the fineness or broad bones, you can use a simple test is sufficient to measure the circumference of your wrist. If it is less than 16 inches, the bone is thin, if it is 16-19 inches – the bone is normal, but if more than 19 centimeters – boned. While the muscles and bones soaked in liquids that gives them the difference between the weight of a person. In addition, the weight of the bones may depend on body type, which happens to be asthenic, normosthenic and hypersthenic. Weight and bone density can decline with age because of the skeleton washed out minerals and calcium. The result is bones become fragile, porous and light, which significantly increases the risk of fractures and diseases such an insidious disease such as osteoporosis. This is especially true of fine-boned people, and especially blondes, at risk of this disease. Depending on the growth of the skeleton the average human adult has a specific gravity of from 7 to 10 pounds. To avoid age-related weakening of bones, should be consumed a large amount of dairy products and regular exercise body because exercise strengthens the skeleton of the best of all calcium supplements. It should be remembered that the reduced weight of the bones is not always associated with osteoporosis – it can be affected by various genetic diseases, improper or unbalanced diet, and even congenital defective part of bone mass.